Hello again, today me and Tom went down the front again to take more pictures, how amazing is the candy floss I got?! They didn't sell it on a stick but said they'd do it for me then came out with this beast that's bigger than my head. It was so yummy but I couldn't eat it all so gave some to a little girl that was eyeing it up for ages, so sweet. Also we just got enough pictures before it started to rain which was annoying and funny to watch everyone flee to their cars and head home. I do hope the nice weather comes back so we can get more candyfloss and doughnuts/ice creams yummy!! I've got a busy few days coming up booking all my travel for the style blogger awards, doing more blog posts and finding an outfit. I'm also thinking a massive blog re vamp is in order soon. Any suggestions or things you'd like to see/change? 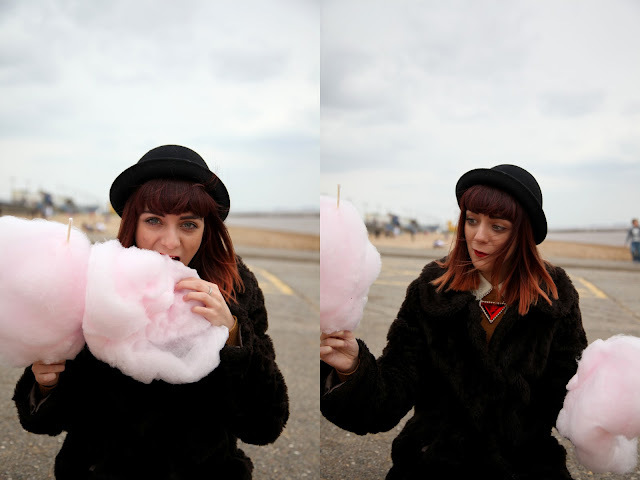 I blooming love candy floss but I always end up getting it stuck all over my face! Mmm I love Candyfloss! You look gorgeous Ella!